OMG isn't peridot sooo adorable!!!! "You spin me right round baby, right round! Like a record baby, right right round round!" As I was browsing through these, I was listening to this. 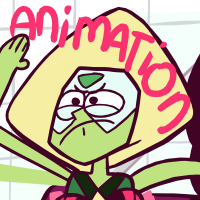 "Has anyone anywhere made a gif yet of just peridot going around and round in the toilet?" This is one of the many reasons why peridot is my favorite character. Am I the only one who noticed a original GameBoy next to Peridot and the toilet? can i use this on my profile? Its ... not ... working. One day you gonna make it. I believe in You! Ohhh, i would be awesome to see her reaction after witnessing what Steven does on the toilet. "EW EW EW EW EW EW EW EW!" this gif + chorus ( www.youtube.com/watch?v=PGNiXG… ) = laughter! The pipes are much too narrow. Sorry Peridot. i can think of no better place to execute a master plan than the thinking chair. When you realize that your life is so shity, that you decided to flush yourself down the toilet.